Look at me, I’m learning! As many of you know, I am allergic to storyboards, character worksheets, index cards, multi-tabbed notebooks and all examples of an organized writing process. I’ve tried to do them all, I really have. They make me break out in hives. I think they’re wonderful–for other people. But for me, they feel like forcing a square peg into a round hole…where the square peg is my brain, and the round hole is one of those gnawing little mouths on a cheese grater. Just. Can’t. 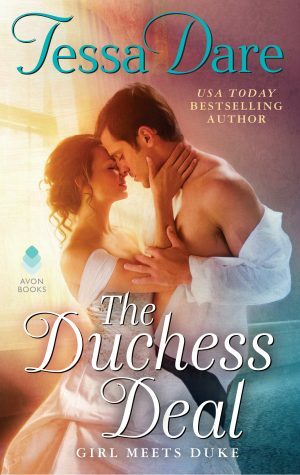 But a few weeks ago, I was reading a wonderful new historical, The Wicked Ways of a Duke by Laura Lee Guhrke, and something kind of cool happened. I had to put it down. No, that’s not the cool part…hang on. 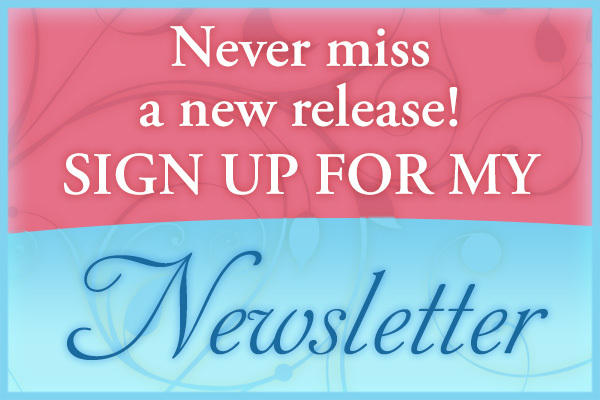 When I came back to it, of course I had not marked my place with a bookmark (that would smack of organization! *sigh* how I became a librarian is beyond me). So I thumbed through the scene I’d been reading to find my place. It was a looooong scene. A loooong conversation, in fact, between the hero and heroine, and it went on for pages and pages and pages. But I realized that…when I was reading, it hadn’t felt long at all. LLG had me so caught up in the scene, it could have gone on for fifty pages, and I would have been delighted. Which made me think about Goats on a Boat Surrender of a Siren. You see, in Goddess of the Hunt, the characters are almost always in motion. Riding, shooting, nearly drowning…there was always a physical activity that helped propel the scene forward. The pacing in SOAS is very different, because it’s sort of a cabin romance–a large part of the tension comes from the fact that, for a large part of the book, the hero and heroine have very little to do. There are scenes where they just talk to one another, for pages and pages and pages, and I’ve been worried that those scenes do not flow so smoothly as the brilliant LLG’s. Here is what I did. 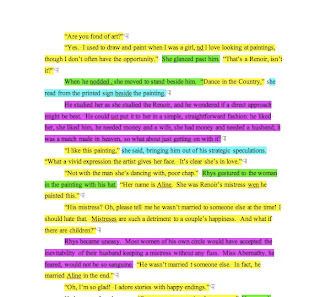 If I’d been an organized sort of writer, with four colored highlighters at the ready, this would have been much easier. But I didn’t have those, so I propped TWWOAD by the computer and typed out five or six pages of that conversation. 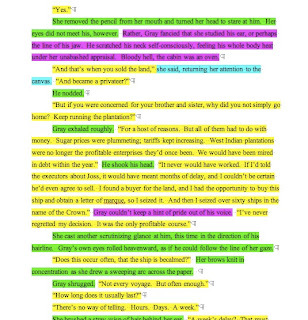 Then I used Word’s highlighting function to shade each of these elements in a different color: Dialogue, dialogue tags, introspection, stage direction (what the characters do, physically), and setting description. I don’t know that it’s very clear from those two tiny snips, but when I looked at the whole result, side by side, it was very clear that my scene differed from LLG’s in one big way: Wayyyyy more green. (This is structurally speaking, of course. LLG’s prose is better than mine in about a thousand ways, but you know…) Green was the color I used for stage direction and action tags. 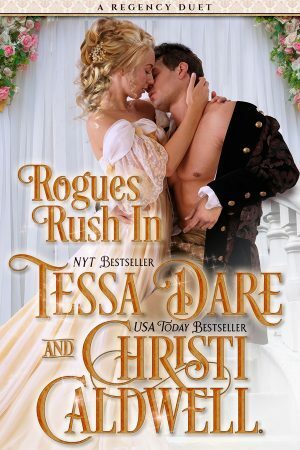 All those things like, “She nodded.” “He shrugged.” “Their gazes met.” “He reached for the teapot.” I had tons of that stuff in my scene, and LLG had very little. Epiphany time! I realized the reader doesn’t need every blink, nod, shrug, and stare spelled out for her. Those things are filled in by the reader’s imagination for the most part (I imagined them while reading LLG, at any rate) and writing them all out slows a conversation down. I’ve been cutting this sort of thing whenever I can as I revise SOAS – cumulatively, I’ve cut three pages of it in the first half of the book! And I did it with color coding, heretofore something I’d believed to be the essence of eeevil. If there’s a type of scene you’re struggling with, and you know of an author who does that same sort of scene very well – I highly recommend trying this exercise, or something like it. If even I can do it, anyone can. Oh, and the other huge difference I noted between my scene and LLG’s? LLG’s adverb count: Zero. Mine: Too shameful to admit. I’ve been cutting those, too. I’ve seen this editing/revising method talked about in many places but I hadn’t thought about comparing with someone who does it well. Though my problem is less having too much extra stuff but having too little. For the sake of pacing and worrying about overdoing, I leave out things I think I should include. I need to try this – eventually. LOL! Can’t compare if I don’t write it! So glad you’re feeling better, Tessa! As you know, I’m revising, or actually unwriting, a book. I have to get the word count way down, and I’m knocking off “he said” and “she blushed” left and right, not to mention the adverbs. The bones beneath are fine, but the saggy flesh just has to go. This process I think will really help me the next time out in fresh waters. Tessa, super thanks for this tip. Like Terri, I hadn’t thought to compare with someone else’s work. Duh! Of course, the method makes far more sense now. I love this editing/revising method. though I use five colours, with the margie lawson technique. It’s so amazing how much you can see when you are looking for the different colours and not just the words. I have done ‘handout’ highlighting in the course, and highlighted my own stuff to see where I need to spruce it with another colour. It’s an awesome method! And you learn so much. OMG! So everyone does this already? I swear to God, I thought I was so clever in thinking it up. That is so me. I’m always reinventing the wheel: Ooh! I have a great idea for a historical! There’s this hoyden, and this emotionally repressed lord with a traumatic childhood, and they’re always either arguing or kissing… Aren’t you astonished by my out-of-the-box thinking? Tomorrow, I’ll share with you all the secret ingredient in my peanut butter sandwiches – I add jelly! You’d have never thought of it, I’m sure. LOL Tessa. What makes your discovery so great is your enthusiasm about it. Tessa, you are hilarious! And you are a genius. I would never have thought to do this highlighting without someone suggesting it to me in the first place! I’m so glad this helped you! I have Margie Lawson’s online workshop and figure I’ll have to dive into after I get this ridiculous book out of my head. But, I love comparing it to someone else too! PS Peanut butter and pickle sandwiches, my friends. That’s the ticket. But, it has to be the Claussen pickles in the refridgerator section. Honestly, it’s the best. I just took the Margie Lawson workshop where she covers this, and she mentioned that she didn’t think it worked as well trying to highlight on your computer, but looking at your success, it seems to work just fine. I have to remind myself not to add the running commentary too. I know I love those ah-ha! moments. It really doesn’t matter if someone else pioneered the same method. I always find that discovering something on my own, as opposed to reading about it in a “how-to” book, makes me far more likely to retain and utilize it. Now I’m off to prune my adverbs (bet I have more than you did!). At first, I was going to comment without reading any comments and say that your technique was ruddy brilliant. But then I read all the comments and, to tell you the truth, I still think it’s ruddy brilliant. Because, like you, I’m adverse to any sort of organizational approach to writing or revising (or re-writing in my case) but if this is going to help me write in a less tortured fashion I am all for it! “Ruddy brilliant, I tell you, ruddy brilliant.” she sagely shrugged. Now where are my highlighters…. Tessa, I had just read about this way of revising earlier this week, and I wondered how helpful it would be (as in ‘is all this work going to teach me anything or just distract me from writing’), so seeing how it helped you is very encouraging. And I wouldn’t worry about others knowing of this method-that you came up with a great revision tool and thought to share with everyone says so much about who you are! Well, I’ve never seen it done like this. And I think it’s fascinating. Also, did I read up in a later post that you’re pregnant? ?